Disney's 102 Dalmatians: Puppies to the Rescue is an action game developed by Crystal Dynamics and published by Eidos for the Sony PlayStation and Sega Dreamcast. It is based upon the 2000 live-action film 102 Dalmatians. French Disney Les 102 Dalmatiens: À La Rescousse! 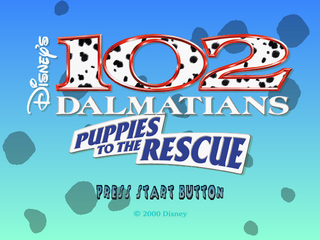 Disney 102 Dalmatians: At the Rescue! Main article: Disney's 102 Dalmatians: Puppies to the Rescue/Magazine articles.